Summary: Four decades of peace have done little to ease the mistrust between humans and dragons in the kingdom of Goredd. Folding themselves into human shape, dragons attend court as ambassadors, and lend their rational, mathematical minds to universities as scholars and teachers. As the treaty's anniversary draws near, however, tensions are high. 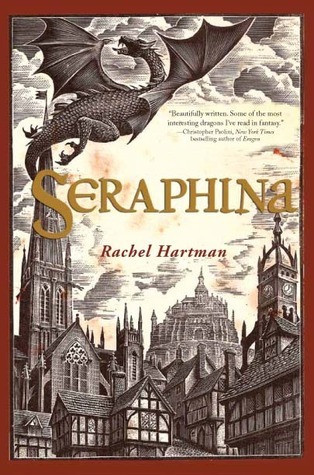 Review: I had heard amazing things about Seraphina and was totally psyched to read it. I mean high fantasy and dragons? Sign me up! Luckily Seraphina did not disappoint! I really, really liked this book. I mean the first line is "I remember my birth." Seriously? That line screams how good this book is going to be. Seraphina is part dragon part human and so she is thought of as an abomination. This secret while not controlling the whole plot, is integral to the story. I loved Princess Glisselda and Seraphina's relationship. It was a fun friendship and I liked seeing the barrier between royalty and commoner be broken down a little. Though honestly the real breaking down of positions was between Seraphina and Prince Lucian Kiggs, but I'll leave you to find that out... Also Kiggs is so cute and is now on my list of book boy crushes. Another relationship that I really liked was the one between Seraphina and her teacher Orma. Since her dad is a a** it was great for her to have a father figure. Also there is a great scene between Seraphina and Prince Lucian in regard to Orma. If you know me you know I love reading about the politics and mythology of fantasy worlds and Rachel Hartman does a great job of bringing the back story to life in an interesting way. Also the world building is so well done. I am a sucker for description and Seraphina contained just enough to keep me happy but not so much that it would turn off anyone who does not like it. Another thing that I really liked is how Seraphina's visions were important. A lot of times if a character has issues with that sort of thing it is just there to make the character weak or be convenient to the plot. But Hartman really used them in an interesting and different way. I was surprised by the reveal toward the end which is always nice. Thinking back it makes sense though so it was not completely out of left field. Overall I really liked Seraphina. It was spellbinding and just complex enough. The fact that music was incorporated though it all made me really happy (as a person who plays three instruments I really appreciated it.) And I cannot wait for Dracomania! I enjoyed this one too - my favorite bits were the politics and world-building. I wasn't bowled over by Kiggs, but maybe upon a reread I'll like him better as a character. Definitely looking forward to the next in the series! This was my second favorite read of 2012 (after Code Name Verity) and I pushed it on a couple of other people who adored it as well. Glad you're getting the word out!